9 June 2016 – Every week I get a bunch of sheep meat through work and I always find myself wondering what the heck to do with all the fat that gets trimmed off since I hate to see it go to waste. Well, I recently learned that you can make candles and cooking oil out of this fat by rendering it into what’s called tallow. Here’s how I did it! The whole idea to make candles out of sheep fat came while visiting Sovereign Hill with the family. 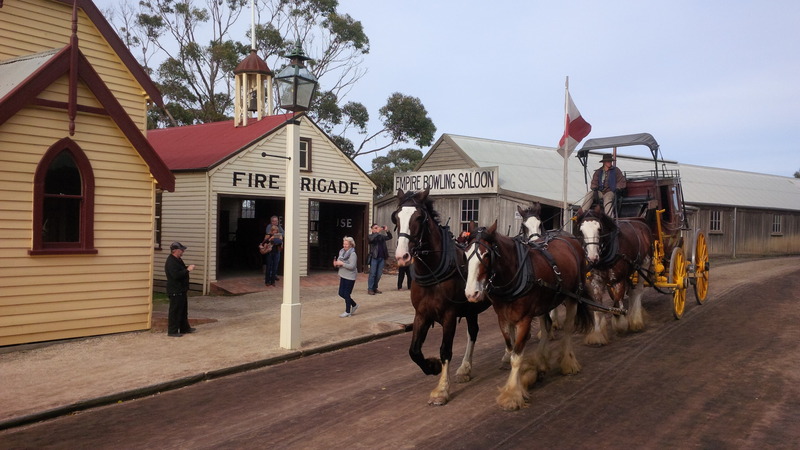 Sovereign Hill is a re-creation of an old 1850’s gold mining town in Victoria, Australia. Old style shops are attended by people dressed the part, horse-drawn carriages make their way through the unpaved streets, and fire pits stay lit along the streetside to keep passersby warm. You can attend school and learn to write using quill and ink, wander through the quaint homes of a bygone era, or visit the local candle shop to see how candles are made. It turns out the candle shop is a legit operation, creating beeswax candles that get sold all throughout Australia. During a tour, the woman was explaining how candles were made and she made a quick reference to how you can actually make candles out of most any type of animal fat. In fact, during the depression-era and WWII years, she remembers her mother buttering her toast with the drippings of candles made with fat. The light bulb immediately went off in my head: I was going to make candles out of sheep fat! 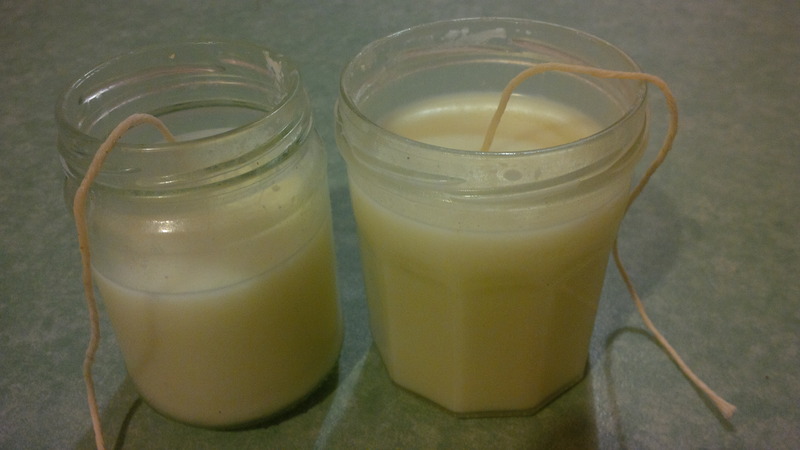 Candles – the tallow will provide the fuel needed to burn a candle. Basic survival – because it does not spoil, if your life depended on it you could eat the tallow for survival and you woud be fine. If you don’t do a good job of filtering out the impurities, it doesn’t mean that the candle won’t work. It will, however, put out dark smoke and smell like mutton. Separate the fat from meat as well as possible. It’s easiest to do this when the meat is cold, in which case the fat usually comes right off. Cut the fat into very small pieces, which will speed up the melting process (some people use graters or food processors). Place the fat into a frying pan and add just enough water to cover the bottom, which will prevent the fat from burning. Occasionally stirring the contents, allow the fat to slowly melt down. This will take a while. 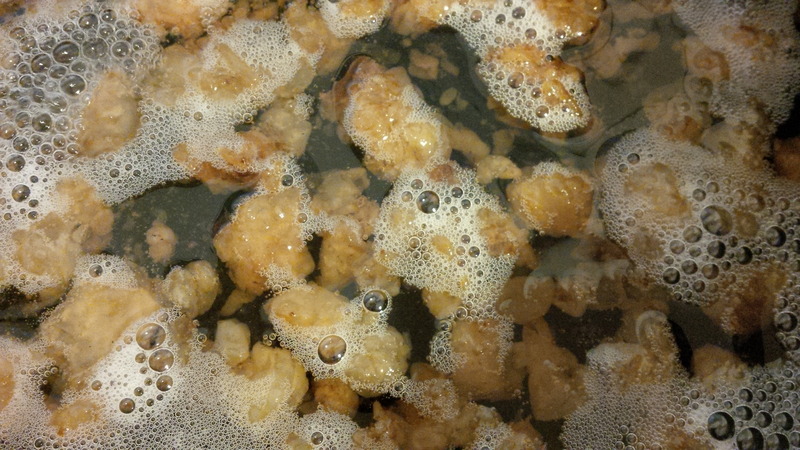 Once the mixture starts making crackling noises, you are getting close to being done. Once the crackling noises more or less stop, then the melting process is finished. Pour the liquid into a jar through a cheesecloth or other method of fine filtration (I used a nylon stocking since I did not have cheesecloth at the time). Allow the liquid to cool and harden. 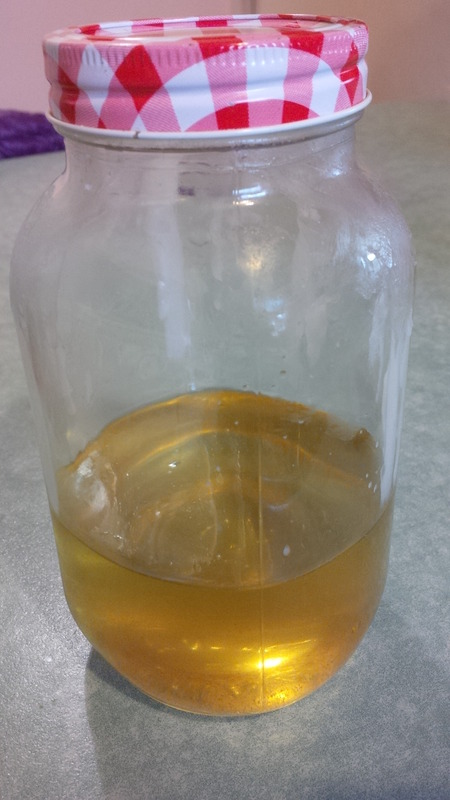 Although it looks yellow, if filtered well it should turn white when finished. 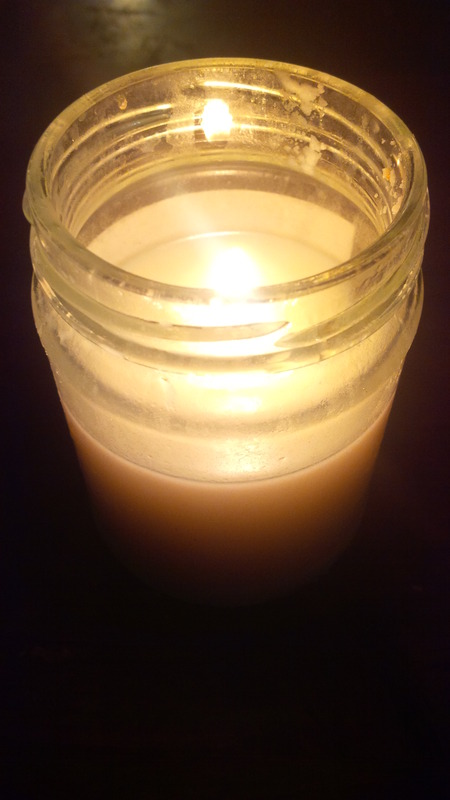 If you are making a candle, be sure to suspend a cotton string or other form of wick in the center of the mixture. Dunk the wick deeper than it needs to go and then pull it back up so it gets coated with tallow. This will make the wick more stable. 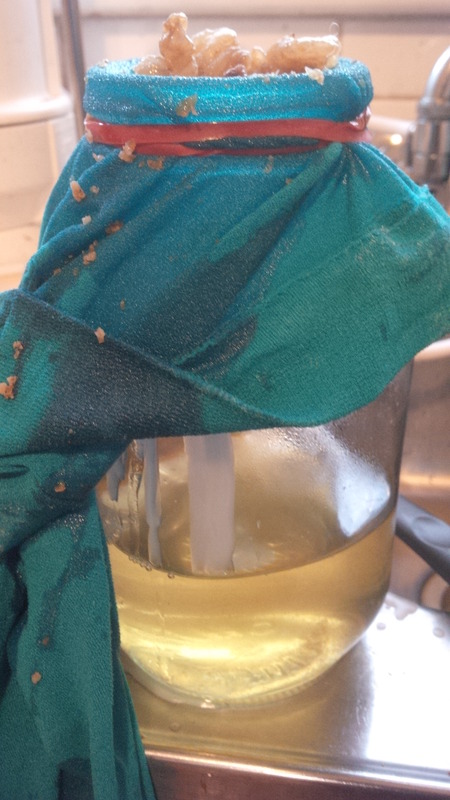 Impurities are filtered out using a fine filter like cheesecloth. The liquid tallow may appear yellow. 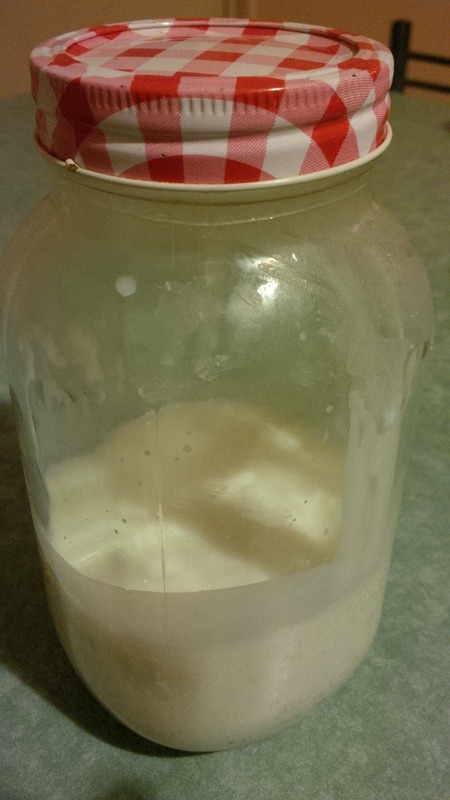 The tallow should turn white once dry if it was filtered properly. This is what the candles look like with a wick put in. Shortly after making my first candle, I was asked to cook my “famous” crispy salmon dinner. I normally use grape seed oil for this (which is more tolerant to high heat as compared to olive oil), but figured I might as well give my new tallow a try. Since I’d already made my candles, I stuck a fork in one of the candles and took out a few clumps. Once the pan was good and hot, I added the tallow and seared my salmon over the high heat. I didn’t tell anybody I’d used the tallow and they told me it was the best salmon I’d made yet! So regarding whether or not it works, I guess the proof is in the salmon (dad joke, sorry). Mission success! Not only did I make candles using fat that would have otherwise been thrown away, I inadvertently discovered a good grease for cooking food as well as something I could eat and survive off of for a short while if my life depended on it (let’s hope I don’t have to ever put that one to practice!). This reaffirms for me how cool rediscovering some of these “lost arts” can be. I had a bunch of fun figuring it out, and once we establish our future homestead this will be another great way of minimizing our cost of living and level of waste.